Team Daniels is an inspiration to so many of us. They are regularly at the gym four days a week, supporting and challenging each other. Their workouts keep them in great shape for new adventures and doing the things they love. Over the years is has been impressive to watch their confidence grow and their stamina flourish! Age: Jill is 59, Tony is 64. Length of time with Hyatt Training and date when you started: We’ve been working with Beth for the last four years and joined Hyatt Training a year and a half ago (June 2017). Our biggest goal was to feel successful transitioning to a new gym with a different structure and maintain a healthy workout schedule. I remember coming to Hyatt Training and feeling like we were heading to our first day at school and wondering what all the other kids might be like, would they like us and will we fit in! We realized quite quickly that Hyatt Training offered new opportunities to reshape our workout routine and explore new challenges. Jill: I would love to be able to consistently nail the “hour of power” once a week. Tony: Keeping the weight down and loosing more fat and gain some strength and better balance. What has been your biggest challenge? This past year has had many family challenges that have disrupted our workout routine so maintaining a consistent workout schedule and jumping right back in after periods being away has been challenging. What have been your biggest areas of improvement? Jill: Making progress on push ups almost to the floor – hitting failure point during one workout made me feel proud that I had given it my all and not held back! Tony: Maintaining good shoulder mobility and upper body strength. What is your favorite thing about Hyatt Training? There are so many things it is hard to identify only one. We love the supportive environment and watching the diversity of the workouts – I rarely have a workout where I don’t see another client doing something and I think – I wonder if I can do that or that looks like a fun challenge! What is your favorite thing about your personal trainer? 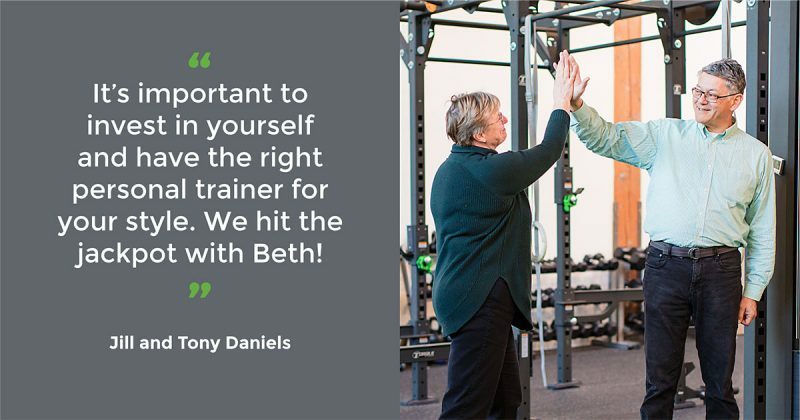 Beth is always positive and smiling – we feel so fortunate that she is part of our lives inside and out of the gym. Beth just “knows” us and can tell when it’s time to push and when it’s time to support. Her knowledge and focus on developing minor muscle strength and stretching work have kept us injury free. Staying with workouts at least 3 to 4 times a week and trying different routines as replacement for the classes we were used to. This has helped us to feel a part of something larger, which we had previously enjoyed. What have you learned: How important it is to invest in yourself, both in terms of time and having the right personal trainer for someone’s style. We hit the jackpot with Beth! What advice would you give to other people starting on their fitness journey? Everyone’s journey with fitness starts somewhere. It’s important to take that first step and just keep moving forward. Be proud of your accomplishments and continue to be forward thinking with an occasional look back to see how far you have come!